This 10-week plan revamps a classic training program to maximize gains in both muscle size and fat-burning. 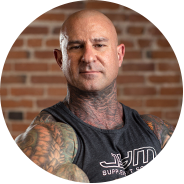 Every program can use a refresher, even one that continues to deliver impressive mass gains for thousands of JimStoppani.com members every month. Back by popular demand – and updated by scientific demand – is a revised version of my classic Down and Up Mass training program. The original plan was a true 4-day body part split. Now, Down and Up becomes a full-body routine, yet with the split concept still intact by way of my Stoppani Full-Split (SFS) system of program design. The new version, appropriately named Down and Up Mass Full-Split, is still 10 weeks long and will deliver the same impressive muscle-gaining results as before. But expect those muscle gains to be a little bit leaner this time, as full-body training is known to maximize fat loss. If you’re following along with my Train With Jim series, this program is coming on the heels of Super-Man Remastered. I figure the best follow-up to all of those Super-Man supersets is a program that uses straight sets and a variety of periodization techniques. While Super-Man alternated between linear and reverse linear periodiation, Down and Up has you using both simultaneously. If you want the best of both worlds – arguably my most popular mass-gaining program combined with the fat-burning benefits of full-body workouts – Down and Up Mass Full-Split is the way to go. Let’s build and burn! The Down and Up Mass concept hasn’t changed from the original to this full-split version, but the training split is slightly different. What was originally a 4-day split has turned into a 5-day split – meaning, over the course of five days, each of the 10 major muscle groups (chest, back, shoulders, legs, biceps, triceps, traps, forearms, abs, calves) will get more “focus” in one workout, though all body parts will be trained in every session to keep it a full-body routine. If you recall, the original Down and Up Mass program paired triceps with chest, and biceps with back. This time around, triceps and biceps will share the same focus day, along with forearms. Focus muscle groups will receive higher volume in their respective workouts – anywhere from 2 to 5 exercises per body part (2 to 3 for smaller muscle groups, 4 to 5 for larger ones). All other “non-focus” muscle groups will get just one exercise each. Like the original Down and Up Mass, this version incorporates FOUR different types of periodization to keep the muscle gains coming: linear, reverse linear, undulating, and pendulum periodization. Reverse linear and linear are intertwined throughout the 10 weeks, alternating every other week during Weeks 1-6 and in the opposite order in Weeks 5-10 (with a slight overlap in Weeks 5 and 6). In Weeks 1-6, Weeks 1, 3, and 5 represent linear periodization (where rep counts decrease and weight increases each week), and Weeks 2, 4, and 6 are reverse linear (reps increase, weight decreases). The alternating fashion between the two styles also makes it an undulating periodization scheme. In Weeks 5-10, Weeks 5, 7, and 9 are reverse linear, and Weeks 6, 8, and 10 are linear. The fact that in the second half of the program the odd weeks switch to reverse linear and even weeks are linear (whereas in Weeks 1-5 it was the opposite) defines pendulum periodization. And again, the week-by-week alternation makes it undulating. I know, it can get confusing sometimes. To some, it might seem like a confusing puzzle. But it’s really not – it’s a pattern. The way I laid it out, Weeks 1, 3, 5, 7, and 9 are your "heavy" weeks, where rep ranges are on the low end – 9-11 reps is the highest you'll go during these weeks. Weeks 2, 4, 6, and 8, then, are your "light" weeks, where reps are higher – 12-15, 16-20, 21-30, 16-20, respectively. As these names imply, it's important that you change the weights accordingly from week to week. When fewer reps are called for, increase the weight; likewise, drop the weight when rep counts increase. In other words, you should be going lighter in Week 2 than in Week 1, and then heavier in Week 3 than you went in Week 2. That said, you should be gaining both muscle and strength through the course of the program, so when the 9-to-11-rep range rolls around again in Week 9, you should be using more weight for the same exercises than you did in Week 1; likewise for Weeks 3 and 7 (both 6-8 weeks), Weeks 2 and 10 (12-15 reps), and Weeks 4 and 8 (16-20 reps). As you’ll notice, the outer extremes of the periodization scheme – specifically, rep ranges of 3-5 and 21-30 – aren’t typical of a mass-gaining program. I mentioned this in the original Down and Up Mass program overview, but it’s worth repeating. Sets of 3-5 reps may seem too heavy to maximize hypertrophy, and 21-30 reps may seem too light to build size. But this couldn’t be further from the truth. If you want to build muscle, you need to build strength; hence, the 3-5 range. Watch — pretty soon you’ll be able to use more weight for your sets of 6-8, 9-11, and 12-15 reps. This will lead to more overload and better size gains. As for the high-rep sets, one study out of Japan, published in the Journal of Strength and Conditioning Research, showed that subjects incorporating sets of 25-30 reps into their programs showed greater gains in both size and strength than those who skipped the high-rep sets and stuck to only heavy weights. The key is to take your sets to full muscle failure, whether the reps are high (21-30), low (3-5), or in between (9-11, 12-15, etc.). That’s how you build muscle. As you'll notice, each exercise gets 2 sets per in Weeks 1, 3, 5, 7, and 9 ("heavy" weeks). This is consistent with the original Down and Up Mass program. Two sets may not seem like a lot of volume, but here's why I didn't make it 3 sets: because on the second set of each exercise, you'll do a rest-pause set followed by a drop set. For example, when you reach failure at, say, 10 reps, you'll set the weight down for 15-20 seconds, and then pick it back up and rep out again to failure – this is your rest-pause. Then, you'll immediately decrease the weight by 20%-30% and do a drop set. Again, you'll do this rest-pause/drop set combo only on the second set of each exercise on odd numbered weeks (1, 3, 5, 7, 9). In Weeks 2, 4, 6, and 8 ("light" weeks), the sets increase to 3 per exercise, as you will NOT be doing any rest-pauses or drop sets in these workouts; rather, you'll simply take every set to full muscle failure on all exercises. However, pre-exaust will be utilized in these workouts, as single-joint exercises are performed before compound moves for focus muscle groups – ie, cable crossovers and flyes before bench press for chest; straight-arm pulldowns first for back, before lat pulldowns and rows; rear delt raises, lateral raises, and front raises before overhead presses for shoulders; leg extensions first for legs; etc. Sets taken to failure and pre-exhausting focus muscle groups will go a long way toward sparking muscle growth. As I've said before, doing additional cardio while following my full-split routines isn't necessary. The full-body workouts themselves are great for both enhancing fat loss and improving conditioning. That said, I know some of you will want to add cardio to the program. If you do, I recommend either HIIT cardio (at the end of workouts or in separate training sessions) or cardioacceleration between sets during the Down and Up Full-Split workouts. HIIT cardio is actually great to do on rest days (i.e., weekends). Do some Tabatas on non-training days, or do one of my active rest workouts like the Lucky 13 HIIT circuit. Since you’re doing all straight sets in this program, you may be wondering how long to rest between sets. The goal is to build size and burn fat, so try and keep rest periods brief. But you also want to make sure you’re hitting your rep counts, so don’t make your breaks too brief. A good rule of thumb is to rest 1-2 minutes between sets in the Down and Up Mass Full-Split program. But if you’re in really good shape, you can probably get away with dropping rest periods to 45 seconds, and maybe even 30 seconds, between sets.